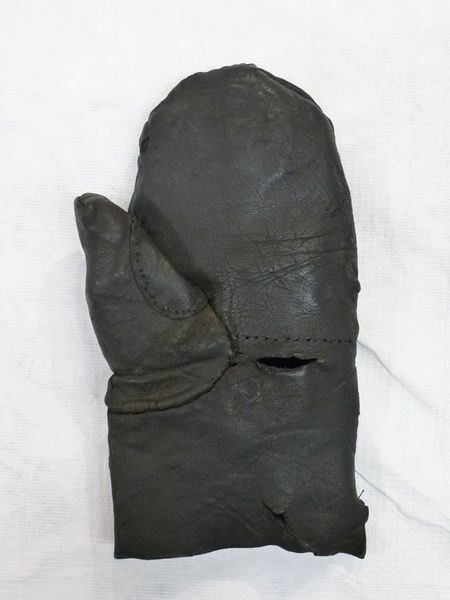 Mittens such as these were worn primarily by workmen. They are a fairly common archaeological discovery and they are frequently found in waterlogged environments, such as the mud on river banks. It is made from sturdy leather and would have been very hard-wearing. Recycling and reuse was common, and this one has been repaired with a small leather panel stitched over a probable tear on the thumb. The stitch holes along the front and back may at first appear to be evidence of missing decoration, but probably suggest that the glove is made of leather reused from another item. 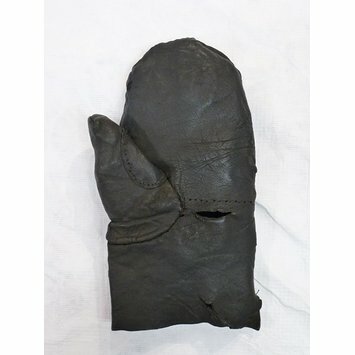 Unlined and undecorated mitten for the left hand, formed from three pieces of leather, blackened, extra leather pad applied to thumb possibly as a repair. There are small tears on the palm and near the wrist opening, and stitch holes are present on the back and across the palm.